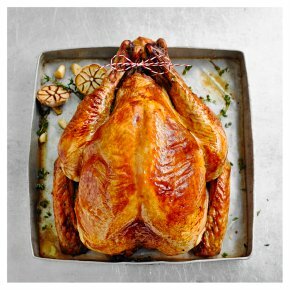 Duchy organic free range bronze-feathered turkeys are a slow-growing breed celebrated for their full flavour and succulence. These birds are part of the Duchy Originals from Waitrose & Partners range; a wide variety of delicious products that are created in an endeavour to preserve British food heritage. They are therefore reared to exceptionally high standards on organic farms in East Anglia and the hills of Donegal in Ireland, fed an organic diet and have free access to either organic pastures or woodland during the day. All this organic high-living for our Duchy birds makes for a turkey with a taste that is a cut above. For Christmas orders this product has a use by date of 26th December 2018. Save the giblets that come with this turkey for making delicious gravy. Simply simmer in water and use this stock as your gravy base. Cook thoroughly until the juices run clear and there is no pink meat.